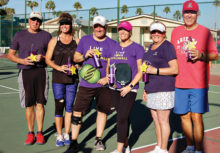 On February 3, the SunBird Pickleball Club held the first annual tournament to raise money to help find the first Survivor of Alzheimer’s. Tournament Director Pete Prucha, longtime SunBird resident and local rep for Gearbox Pickleball Paddles, was well organized and got the event started on time. The tournament featured play for Women’s Doubles, Men’s Doubles and Mixed Doubles. All three groups were divided into A and B levels. Each group featured eight teams, which meant that each team will be required to play seven matches. It was a beautiful day, starting out with a low temperature around 52 degrees and getting to a high of 79 degrees later that day. There was lots of exciting play, and the best part of the day was that we were able to get through the day with no serious injuries. The SunBird Pickleball Club raised $2,470 which was donated to the Alzheimer’s Association. The winners of each player category received medals and purple water bottles. 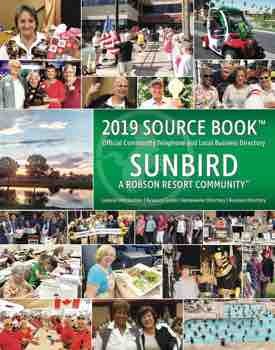 A reminder to all the fun-loving pickleball fans, SunBird Pickleball Club will hold the annual Pickleball BBQ (no we are not BBQ-ing pickleballs, lol) and end of season party on March 17. Lots of food and pickleball activities will be waiting for you, so come on over and have fun with us.